Stefanos Stylianos is the Safety, Quality & Marine Manager / DPA of Minerva Marine Inc. 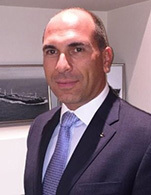 He is an active member of INTERTANKO Vetting Committee, founding member of Hellenic Maritime HSQE forum, member of ITOSF and other working groups promoting maritime safety and best practices. Stefanos started his career with the American Bureau of Shipping as a plan approval engineer and field surveyor specializing in tankers, covering all aspects of Classification. Later joined Shell in their Quality Assurance headquarters in London were he gained unique experience in cultivating advanced safety culture and auditing skills with extensive exposure to global shipping operators. He moved to Greece in 2010 joining a traditional Ship Operator, Andriaki Shipping as Vetting & Compliance Manager before joining Minerva Marine Inc.
Stefanos has a Masters from Newcastle University and Bachelor of Science from University College London in Naval Architecture and Ocean Engineering. He brings to the panel a balanced of technical and commercial experience from both sides of the industry.